Much like Vibradermabrasion, DermaDisc uses vibration and a lightly abrasive surface to gently exfoliate the outer layer of the skin. Small domed heads, with a fine diamond dust imbedded atop, are gently rubbed across the surface of the skin as the wand vibrates, aiding the exfoliating process. Three different heads, mild, medium, and intense will allow our talented estheticians to precisely control the amount of exfoliation to fit any patient’s needs. DermaDisc is an excellent option to add to any facial. 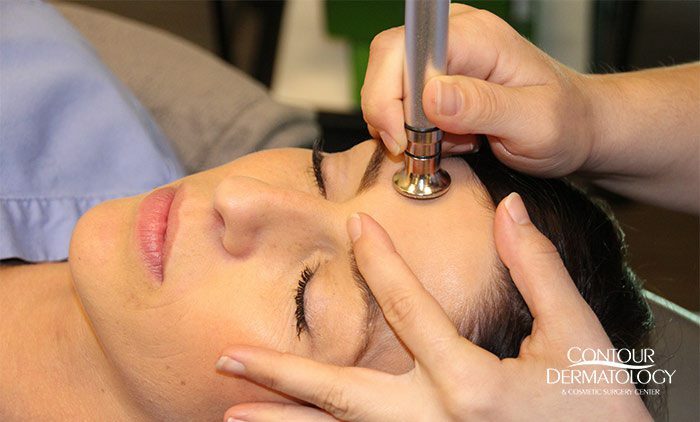 By incorporating DermaDisc into your facial schedule, your esthetician can greatly enhance your results. This treatment is pain free, and takes less than thirty minutes, so it is perfect for those on the go, or those wanting to look and feel fresh and rejuvenated after their lunch break. Because DermaDisc does an exceptional job of cleaning away the old, outer layer of skin, Makeup will go on flawlessly smooth. Some rosiness can be expected for the remainder of the day, but this can easily be covered up with makeup after the treatment. Some things to keep in mind are to avoid sun exposure for the first 24 to 48 hours after treatment, and be sure to only use gentle products in your skin care routine for the first 48 hours after treatment. DermaDisc is a perfect affordable option for those who want to enhance their treatment plan, or pamper someone special with a spa day. Gently exfoliate, and cleanse the skin before a big day, to look fresh and bright, without worrying about down time or pain. Contact Contour Dermatology and Cosmetic Surgery Center to schedule your DermaDisc facial treatment today.